Since I have become a “Dame d’un Certain Age” in French terms, I have been spending quite a bit of time thinking about how I spend my time and what really matters. Why waste time doing things you don’t love, right? Given that particular frame of mind and my “certain age” as a reference point, I have been looking around at the world for quite some time and figuring out how to live in alignment with what matters to me, and I would like to suggest you all try to do the same. Yoga is all about proprioception, not only of your physical form, but also of your heart, soul, and mind. What do you feel in any given moment? What things make your heart sing? What are your honest talents that you can share(and don’t claim you don’t have any, because everyone does!)? When people ask me how to incorporate a personal home practice into their lives, this is something I always mention. Listen to me. Listen really well. READY?? YOGA ISN’T JUST ASANA. YOGA ISN’T JUST GOING INTO A STUDIO AND STRETCHING YOUR BODY INTO SHAPES. Yes, there is that element to it, certainly, but real, honest yoga practice is so much bigger than just the body. Yoga is an approach to life. It is a way of life that should touch everything you do, from what you eat, to how you love, to how you work, and how you grow. In plain English, what does this mean? It means really slow down, and notice your life. What do you feel when you are living it? Take the time to really taste your food, not just wolf it down, and think about the textures and flavors. What do you like or not like about it? When you go to work, what about your employment do you like? What do you not like? Is there a reasonable way to incorporate more of what you enjoy into your daily work routine? If you have been saying you needed to sign up to work shifts at the homeless shelter, what is stopping you? Pick up the phone and call those people!! They need you! If you have always wanted to travel and you could go anywhere you wanted, where would you go? Is there a financially responsible way to make it happen? What would happen if you saved every $5 bill that came into your hands in a special place until you had enough money for a plane ticket to that magical place? At the end of the day, money only matters to the extent that it keeps a roof over our heads and food on the table. We can always do with fewer material things. Life is really composed of experiences and memories, not things. Things matter to you today and tomorrow end up in the garbage. They are ephemeral. Why not put some of your hard earned cash into the trip of a lifetime instead of granite countertops, for example? 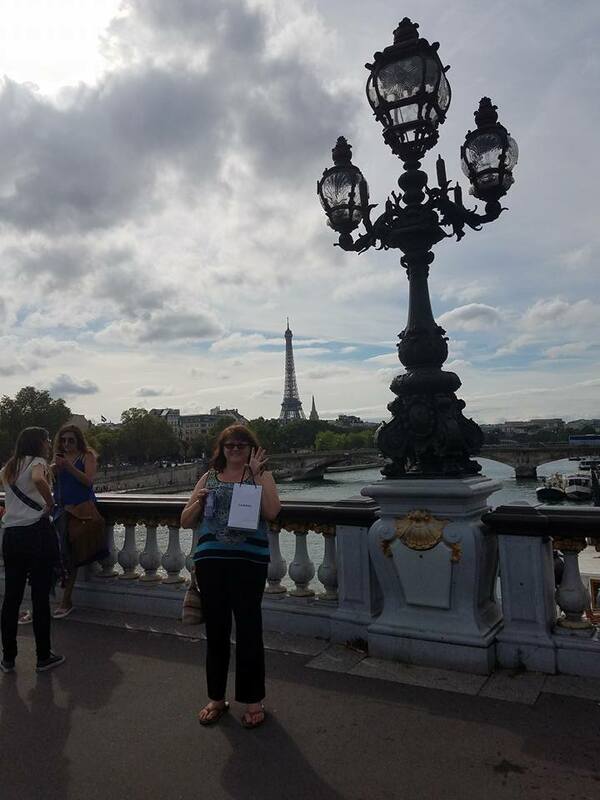 Granite is really pretty, but I can tell you from experience, Paris is so much prettier, and I am so much the better person for having experienced it. I will have those memories always, and when I die, I get to take them with me. All those counters are good for is as a workspace for making dinner, and laminate will serve just as well. When you die, would you rather have seen that place you have always dreamed of, or have fashionable countertops in your kitchen? Start making really conscious lifestyle choices that are in alignment with what matters to you. The only way to know what matters to you is…and you guessed it, PAY ATTENTION. PRACTICE YOUR YOGA. Your life is here. Now. Pay attention to it. If you want to go to Paris(which I obviously highly recommend) or Bali, or Italy, or San Francisco, or wherever, don’t just dream about it, try to make it happen! Notice how you feel EVERY DAY. Pay attention to what makes your heart sing. Move around the planet. Breathe. Love. Share. Taste. Enjoy. Consider. Help others. As the Buddha said, WAKE UP. Yoga instructor Bettie Shea taught Sunday’s class in front of the bar at Barking Duck Brewery. 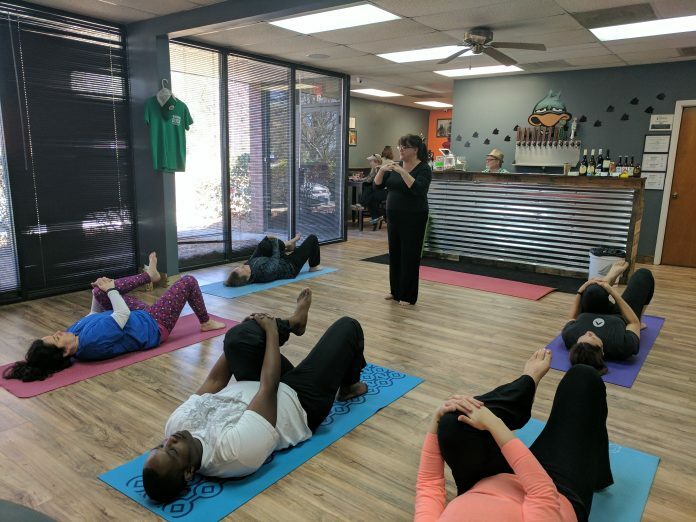 On Sunday, February 26, Bettie Shea of Mint Hill Yoga teamed up with Barking Duck Brewing Company to offer an afternoon of yoga and beer. Sunday’s inaugural “Brew-ga” class drew a crowd of five. Shea was pleased to see both people that she knew who had done yoga with her before and newcomers who had never done yoga. Shea and Carl hope to make “brew-ga” a weekly event. Shea’s class met inside Barking Duck Brewery right in front of the bar. It certainly wasn’t Shea’s normal yoga studio! “It kept throwing me,” said Shea. “AC/DC? OK. I’m not complaining; it’s just a different mindset!” By the end of the class, Shea found herself enjoying the music and wondering if a “classic rock” yoga class might be a good idea. Participants enjoyed the novel atmosphere as well. “It was neat having it here!” said Margaret Wylie, who has been doing yoga with Shea for two years. “We’re used to candles and lights off, super relaxed. This was good and energetic.” First time yogi Jamal Jordan, who attended at Wylie’s insistence, was pleased to see that it wasn’t all candles and mood lighting. “I enjoyed the different environment than what I was expecting,” he said. After the 45-minute yoga session, all participants were treated to a beer. 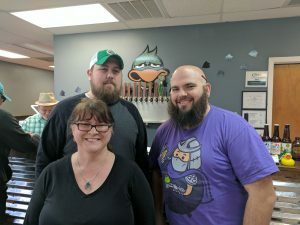 On average, Barking Duck offers eight of their own beers on tap, two “guest taps” from other Charlotte breweries, cans of local Red Clay Cider, and wine. They also offer several options for non-drinkers, like kombucha, soda, water, ginger beer and cold brew coffee. Yoga instructor Bettie Shea with Barking Duck owners Josh Carl and Jake Reynolds. Both Shea and Barking Duck owner and brewer Josh Carl thought Sunday’s event was a big success. “We’re going to try to do it every Sunday now,” said Carl, who thinks it’s the perfect way to end the weekend, relax, and get ready for the work week. They plan for future classes to meet outdoors when the weather warms up. Currently, Shea and Carl plan to make “Brew-ga” a “mostly weekly” event every Sunday at 2:00 pm. The 45-minute yoga class and a beer cost $10.00. Check Mint Hill Yoga’s facebook page for more details and upcoming events. Yoga as practiced and taught in our achievement oriented Western culture is usually a very external, physical goal-focused thing. It is all about “getting the pose,” or “losing weight,” or maybe using asana practice as a way to get ready for a marathon or triathalon. It is exercise. None of those goals are bad in and of themselves, but people cheat themselves of all the practice has to offer when they choose to stop with the superficialities. It is unfortunate that most people are unaware that yoga is so much more than simple exercise. After all, if you just want to improve aerobic fitness or get ready for an athletic event, you can always run to the Y or across the street to the 24 hour gym to get your exercise fix. Take a spin class or a step class or go for a run on a treadmill, perhaps. Why bother going to a yoga studio at all and typically dropping between $16-$18 per drop in class? When an uninformed person goes to a studio and spends this money, or “joins” the studio for a fixed price, all you can drink attendance package with a contract, they think they are getting all that yoga is, and the fact is, they just aren’t. They are missing yoga’s finest, most powerful and important parts, and some of the reason for this is that most western trained yoga teachers are never taught how to teach yoga’s deeper, more powerful, medically and psychologically effective practices. When I trained in Subtle Yoga(TM) with Kristine Kaoverii Weber and Samantha Leonard all those years ago, I was exposed to a yoga I had never before seen. I went into training expecting to learn how to teach a Power Flow class, and that is not what happened. I am so so grateful it didn’t. That teacher training taught me what it meant to show people how to “innercize,” and that is what I have been teaching ever since. In yoga, there are these things that I will call here the Layers of the Self just to simplify. A good yoga class will tend to all of the Layers of a Person, not just the outer, physical layer, although that is certainly important. Focusing just on externals doesn’t help a person to realize their deepest, most honest self. Externals don’t help a person confront and deal with trauma, chronic depression, abuse, anxiety, fibromyalgia, epilepsy, heart disease, diabetes, or even cancer. Externals don’t help a person release the fear stored in the body. Externals don’t give a student tools for self examination and self honesty. Externals don’t help us confront even our own mortality. Externals don’t improve overall mental health the way innercize does. Finally there is a large body of research in the medical community that supports these claims. You can find research into how yoga works from a medical perspective in places like JAMA(The Journal of the American Medical Association), Pediatrics, Medical Hypotheses,and the Journal of Alternative and Complementary Medicine. Externals don’t lead people like Dr Stephen Porges to write at length about Polyvagal Theory, or Dr Peter Levine to study trauma extensively and develop thoughts about how movement can help release it, or David Emerson and Dr Bessel Van der Kolk to write about how our bodies hold onto traumatic experiences in a way that can lead to things like high blood pressure, heart disease, and even PTSD. YOGA CAN HELP TREAT ALL OF THESE THINGS if offered by a well trained, thoughtful yoga professional. By professional, I mean someone that actually reads the medical journals and incorporates practices into class offerings based on the research. That’s why our classes constantly evolve as we learn more and more. Everything we do here is evidence based. I arrive now at my point. Those of us here at Mint Hill Yoga are professionals. We don’t choreograph workouts, we provide solutions to pain, both inside and outside. We offer paths to growth. We offer potential for physically stronger, emotionally deeper, most honest lives. And we can prove it. Come see for yourself. If you would like to take a look at the research, I am very happy to share. Below are some links you might find interesting. I recently got the notice I receive each year during January telling me it is time to renew my registration with Yoga Alliance. For those of you that may not know, Yoga Alliance is the registration service that yoga teachers can join once they have completed a Yoga Alliance certified training of 200 hours or more. That is why we are called RYT’s. The more numbers you have after your RYT, the more hours you have trained, and if you have an E anywhere in your designation, it means that you have taught at least 1000 hours in the case of an E-RYT 200, or 2000 hours in the case of the E-RYT 500. I am currently around 1400 hours toward my E-RYT 500. I am leaving this registration service, which is really all it is. Please allow me to explain. Yoga Alliance provides no supervision of our work as yoga teachers, and no oversight of the Yoga Teacher Trainings popping up everywhere. These Yoga Teacher Trainings send in a pre determined class plan to YA(along with $400), which they agree to adhere to in their training, YA rubber stamps it, and voila! you can call your teacher training YA Certified, which means exactly nothing. Once you get the rubber stamp on your passport, as a school you are free to teach whatever and however you choose, and Yoga Alliance doesn’t check in at all to make certain you are doing what you told them you are doing. They just take your school’s $400 registration fee(and no one seems to know what they do with that money as well as all the money the RYT’s pay to register) and do something mysterious with it. People can go online to the YA website and see my name, picture and a brief biography that I write myself. YA recently announced we were no longer allowed to use any variation of the words therapy or therapeutic either in our YA bios or on our personal websites(unless we put a disclaimer on our websites, which they kindly wrote for us, telling us how to tell the public that our therapeutic credentials and claims had nothing to do with them). It’s all a bunch of HOOEY, and I am done with it. I am dedicated to svadyaya, or self study, and also to satya, or TRUTH. My truth and my svadyaya tell me that Yoga Alliance is full of HOOEY, I am telling people I think they are full of HOOEY, and I am done with them and their registration service, and their telling me what I can and cannot call what I do. 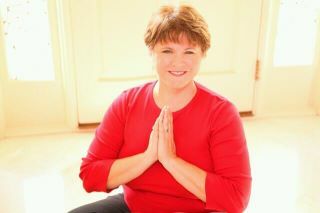 I TEACH THERAPEUTIC YOGA, and people find value and comfort in the practice. I don’t teach power flow, I don’t teach athletic stuff, none of that. I teach people how to breathe, and explore, and find comfort and ease in their bodies. I watch people with insulin pumps have to turn them off because their numbers drop 100 points during pranayama. I watch people with MS stop shaking because of pranayama. I watch the vagus nerve work its magic. I am not the message, I am the guide. I am the conduit. I am not the practice, I am the map for the practice, and the map is therapeutic. To call what I teach anything else is dishonest. Not to worry, students. I am still going to be disappearing for long weekends or sometimes even weeks, going to trainings with teachers I respect and whose message aligns with my vision. I still want to grow and learn and become a stronger and better yogi and teacher as time passes, but I will be playing in my very own sandbox, and I will no longer have an RYT after my name, since Yoga Alliance holds the copyright on the title and if I don’t pay my money I can’t use it(and what does that tell you about exactly how much the title is worth???). I hope you understand my decision and will continue to support my work as a teacher, and our studio as a whole. I am still me. If you ever find yourself in that awkward twilight state known as studio shopping, you owe it to yourself to visit our little jewel box here in Mint Hill. You will never find such a friendly and caring community of students and teachers. We are well known for our hospitality. If you are new to the area and are in search of like minded people to share satsang with, look no further. It is also hard to imagine a more experienced group of teachers. None of us are under 30, and none of us are that stereotypical yoga bodied person that so many potential students find frightening. Anyone of any age can take most of our classes and be challenged and learn something new. We are all well trained, and have an EYT 500, an E-RYT, and a 35 year veteran nurse with her MSN and RYT on staff. One of us did advanced therapeutic training at Duke Integrative Medicine, and another one of us is currently training for her Occupational Therapist Assistant certification. 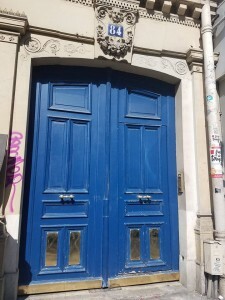 If you want to learn from experience and education, this is the place. We are the real deal. You owe it to yourself and your practice to visit Mint Hill Yoga. We aren’t a gym, we’re a GEM. 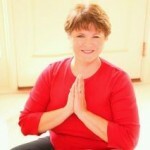 Karen Hill Miller, a master’s prepared RN with 35 years of maternity experience will begin the very first prenatal yoga classes at Mint Hill Yoga on Sunday nights at 7pm starting on June 7. The class will focus on safe poses as well as breathing and relaxation. The poses in prenatal yoga build strength and endurance (great for labor! ), increase flexibility, reduce fatigue, and relieve some of the discomforts of pregnancy. (Don’t be surprised if you sleep much better on Sunday nights after class). The breathing and relaxation are tools that will also serve you well in not only in labor, but also with the challenges of new motherhood! Students are invited to return to class 4-6 weeks after delivery to gently prepare your body for the next phase of your yoga practice. As with other classes at MHY, drop-ins are $12 and a series of 5 is $45. If you deliver or your doctor puts you on bedrest in the middle of a series, your series purchase will be put on “hold” and can use your remaining sessions after delivery. If you have any questions, e-mail Karen directly at khillmiller@carolina.rr.com. What Sets Mint Hill Yoga Apart from the Rest? Certainly the Charlotte area is full of big gyms and enormous impersonal yoga studios where you can go and practice asana in a crowd and sweat, much like the aerobics classes so popular in the 80′s. 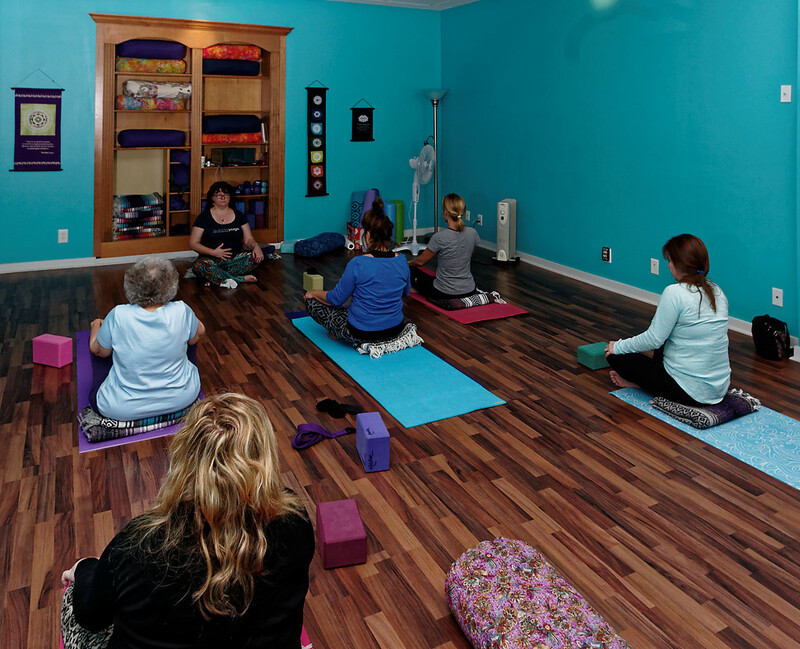 What makes Mint Hill Yoga stand out from the rest? Why should you pay us a visit? 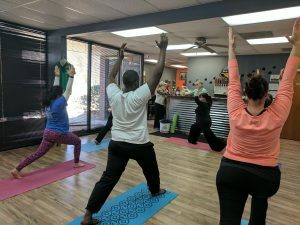 Mint Hill Yoga is unusual in town because we see asana and meditation as holistic wellness tools that can be applied therapeutically, not as aerobic exercises. We are small, with usually less than 12 people to a class, and can look at each student as an individual, remember your name, remember where you hurt and what your unique challenges are, and that is where we meet you on your mat. Our studio is comfortable, accessible to all, and friendly, and we present the physical practices in a step by step, easy way that is approachable by all people of all ages and in most physical and emotional conditions. Our special community is second to none in terms of our supportive and loving attitude toward one another. We encourage students to move and flow(or not) in a way that is natural and appropriate for the individual, and leave fully aware of the miracle of embodiment. Please consider joining us soon for a visit. Drop ins are just $12 each. For a while now, I’ve been trying to come up with a name that really captures the spirit of how we approach flow, or vinyasa classes here at Mint Hill Yoga. If you’ve ever attended one, you know that though you flow, and you probably sweat and get your heart rate up, you still feel…you still feel. That’s it. We aren’t in such a hurry to rush through our sun salutations, warriors, and triangles that we fail to take time to notice how we are feeling, inside and out. Asana touches all parts of us, not just our physical bodies, but the subtle bodies as well. There ought to be an awareness of what is going on with you emotionally and spiritually in each moment, in every breath. Where are you holding tension? Is the jaw locked? The face tense? Notice, and let go. Be mindful. Therefore, as soon as I can get time to make the changes, all our vinyasa classes are going to be called MINDFUL VINYASA. Kiesha Battles gave me the idea last Saturday, and I think it works. Thanks, Kiesha. Happy Birthday Mint Hill Yoga!!! Join us at our Party from 3-5 pm Saturday, September 7!! Free 30 minute classes, first come, first served!! !